Rafina to Andros, Tinos, Mykonos, and Naxos. FAST FERRIES - Autumn offer from Cyclades Fast Ferries for passengers and vehicles from Rafina port. Cyclades Fast Ferries announces an autumn offer from 10 September to 31 October. For passengers from Rafina port to Andros prices from 14,00€, to Tinos prices from 18,00€ and to Mykonos prices from 21,00€. For vehicles from Rafina to Andros car 8,00€ - Μoto 10,00€, to Tinos car 35,00€ - Μoto 14,00€ and to Mykonos car 40,00€ - Μoto 16,00€. 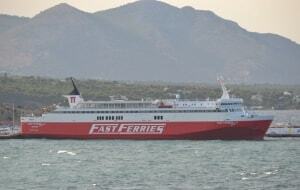 FAST FERRIES - Extra itineraries for vessel THEOLOGOS from Rafina to Andros- Tinos- Mykonos on 23 and 24/03. 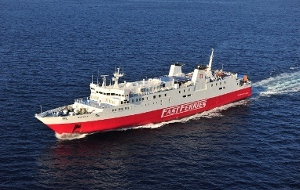 Cyclades Fast Ferries announces extra itineraries of vessel THEOLOGOS on Friday 23/03 and Saturday 24/3, from Rafina (dep. time 07.25) to Andros (09.20-09.30)- Tinos (11.00-11.10)- Mykonos 11.45. The evening itineraries of THEOLOGOS from Rafina, will depart at 18.00 (instead of 17.30). FAST FERRIES - 20% discount from FAST FERRIES for tickets that you will buy on 24/11/2017 for any date you choose! 20% discount from FAST FERRIES for tickets that you will buy on 24/11/2017 for any date you choose! The discount is valid for any type of seat and for vehicles (cars and motorcycles). Fast Ferries offers a 30% discount on individual tickets and vehicle tickets to FastFriends cardholders until 30/09/2017. The discount is provided for all passenger seats, and for vehicle tickets, it will be valid for the cars and motorcycle car categories. Both for the issue of tickets and for boarding, the FastFriends card must be displayed. 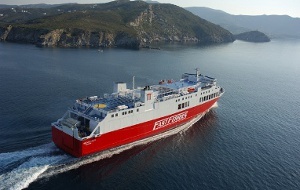 The discount applies to all ferry routes from and to Rafina, it concerns full tickets, and can not be combined with any other company discount. FAST FERRIES - Discount 25% at single tickets of military personnel from Fast Ferries. Fast Ferries offers a 25% discount at single tickets of the military personnel. The discount is valid for economy and numbered seats for every destination and itinerary of Fast Ferries.